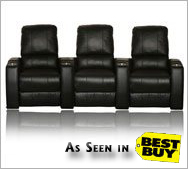 Theaterseatstore is proud to be part of the Best Buy RewardZone partner program in 2010. Through this relationship our products are now available to loyal RewardZone members through their loyalty program website and in select Best Buy Magnolia stores. Best Buy is the largest electronics retailer in North America with close to 1200 stores throughout the continent and a powerful and loyal customer base. In 2010, Best Buy RewardZone members can get 3 points for every dollar spent and an extra 3000 bonus points on purchases of 3 seats or more. This represents an excellent opportunity to earn points fast that are redeemable for many other RewardZone products. Two exclusive models are available in the Magnolia home theater rooms in select stores. They are the Magnolia and the Headliner theater seats. Each seat is unique in it's feature offering. The Magnolia has in arm storage and a space saving foot print where the Headliner brings luxury and size to the home theater seating equation.